In a stunning reversal likely to boost the prospects for a continuation of hospital services and nearly 100 well-paid jobs in West Sonoma County, the newly elected Palm Drive District Health Care Board member Richard Power had withdrawn his opposition to the upcoming Measure A to sell the building to the only buyer in years willing to operate a hospital. 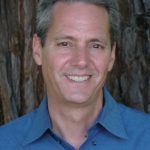 AAMG, whose COO Matt Salas recently explained in detail “Why Sonoma Specialty Hospital is Good for West County” here in the Sonoma Independent. The renamed Sonoma Specialty Hospital (SSH) features a range of outpatient services that include radiology (3-D Mammography, X-rays, dexa scans), lab work, as well as surgery and other services to come online in the future. A high quality drop-in Urgent Care facility, that utilizes the full range of hospital services, just opened in the previous Emergency Department. It is available to anyone with non-life threatening illnesses and injuries from 9 a.m. to 9 p.m., seven days a week. SSH is in the process of being certified as a Long Term Acute Care hospital to care for patients who require ICU and other high quality long term care for their eventual recovery. At the February 4 Board meeting,Richard Power reversed his stand and spoke strongly in support of the sale for its expertly appraised value of $4 million plus a $1.2 million promissory note that would be triggered if AAMG re-sold the facility. Although Board member Jim Horn had, in his ballot statement opposition rebuttal, referred to a higher valued appraisal for the property in his opposition statement to Measure A, that document was never provided to the public and was, according to multiple sources, only a few pages long, hastily done, and failed to account for the millions of dollars of deferred maintenance improvements necessary to keep any medical facility open. 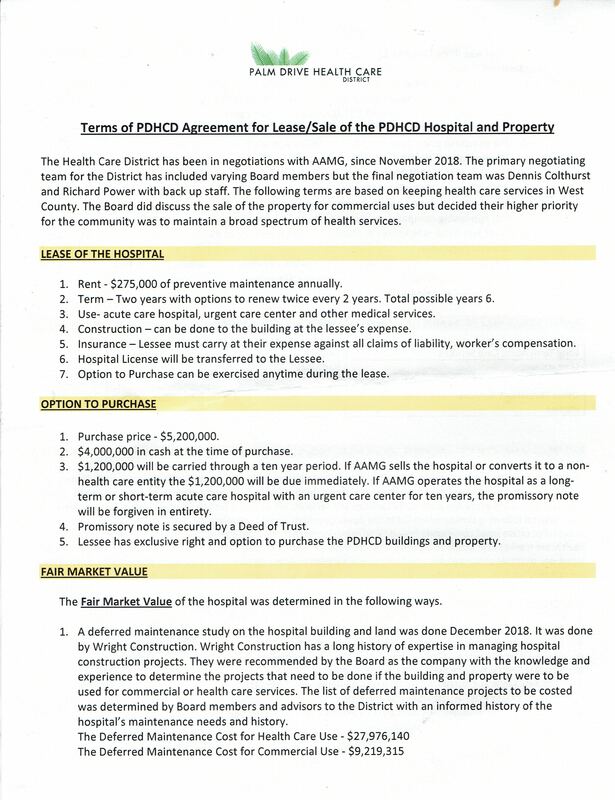 At the February 4 Board meeting, Jim Horn backtracked on his ballot statement mis-statement about the hospital’s appraised value, agreeing that when the $1.3 million cost of demolishing the building was subtracted from the $6.5 million value of the raw land, $5.2 million was indeed the fair market value for the property. Horn then commented that he still “quibbled” with the manner in which the $1.2 million promissory note would be forgiven after AAMG had operated the facility for ten years because, despite the comprehensive assessment that he and others had accepted, “I just have a gut feeling that the hospital is worth more.” Other speakers at the meeting observed that taxpayers have spent millions of dollars per year supporting health services at the facility, effectively more than 20 times the cost of the ten year forgiveness note to AAMG. And that the community will therefore be getting a great deal out of the sale, which eliminates all future liability for taxpayers while providing an urgent care facility, out patient surgery and other health care services at not cost to the District for the next ten years. 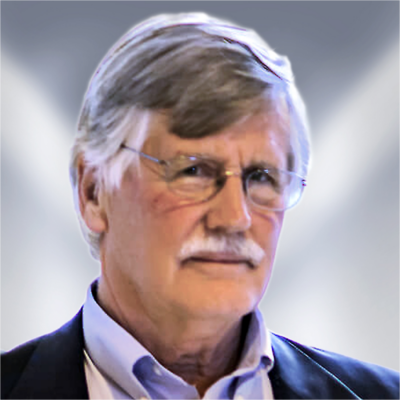 Jim Horn’s view was clearly not shared by attorney Richard Power, or Board Chair Dennis Colthurst, who have worked for months on the complex negotiation. Nor was it shared by Board members Eira Klich-Heartt, or Gail Thomas, or Board attorney Bob Arnone, who explained that by law, the Board had to receive the fair market value to sell the public asset, and that the final value had been derived by a revised January 2019 appraisal by specialist Health Care Appraisers Inc.
Horn’s unsubstantiated “gut feeling” led him to be the only on of the five Board members to vote against the sale on February 4. 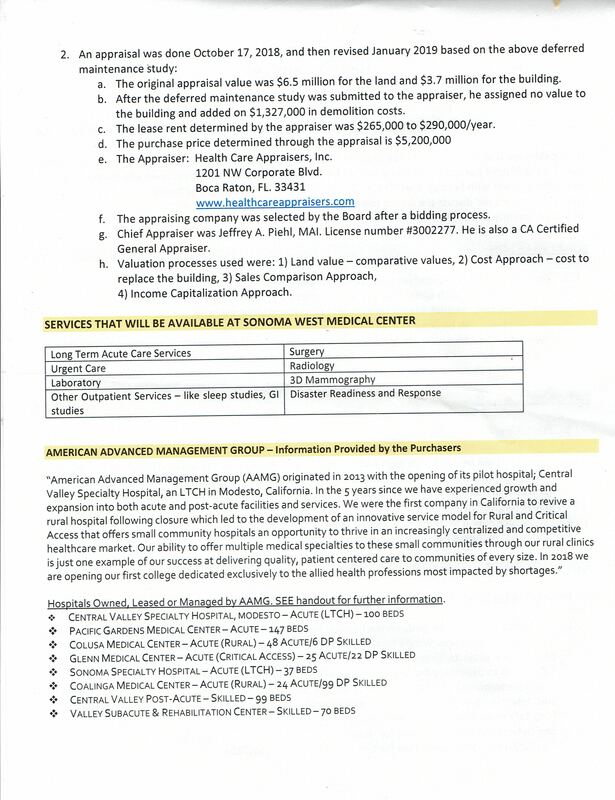 Attorney Richard Power has done a very thorough job of exploring all the pros and cons of Measure A and agrees with those supporting our very special local hospital that this sale is a very good win-win for Sonoma County. The hospital will enhance its role as a hub for health care and acute care hospital services while expanding its mission to include sorely needed Long Term Acute Care beds. Urgent Care which quietly opened this week has seen a steady stream of patients from 9 am to 9 pm, it’s extended hours and all are grateful they have a very short time to wait and have received excellent care. Thank you Sonoma Independent for the excellent in-depth coverage. 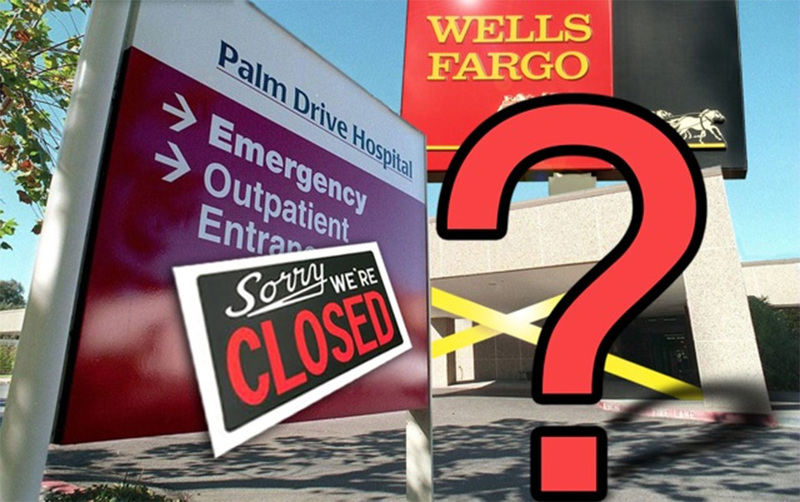 We hope the well-funded real estate and commercial interests allegedly behind so much confusing and negative press will finally allow us to benefit from the presence of a wonderful local hospital instead of another big box store, shopping center, or communications center.